Low Carb Ice Cream | Chocolate Gelato! We were due for a Low Carb Ice Cream recipe when we created this heavenly chocolate gelato. If you've never had gelato, you're in for a huge treat - the texture is creamier and fattier, the taste is richer and you won't be able to stop eating. To make it as easy as possible I've created a recipe video below showing you the exact steps to making this incredible low carb ice cream! Making Ice Cream: No Ice Cream Maker Needed! The huge upside to this recipe is that you don't need an ice cream maker. First of all, we don't have one in our household and second, we don't want to invest in one when you can make ice cream on the stove! There are a couple simple steps to ensuring you come away with ice cream. First, boiling the cream and sugar to create a condense milk. Second, combining the "condensed milk" and two yolks throughly. And, third, whisking the two until you get some froth at the time. Once in the freezer we highly suggest giving it a mix ever hour or so until you've hit your desired consistency (about 4 hours for us!). We Made Chocolate Ice Cream! Although we made several different flavors our first go around, we decided to first share chocolate with you to keep it simple. All you really need is some unsweetened coco powder to create this flavor. Most people also love a chocolate as a reliable go to in times of need. We didn't use an ice cream maker to make this recipe, but if you are in the market for one, the best selling, most affordable and highly reviewed ice cream maker we found is this Cuisinart. If you're looking to step this dessert up notch, maybe because it's your birthday or you just feel like you owe it to yourself, you should make our Chocolate Peanut Butter Cake for topping the ice cream on. You could also use our Maple Macadamia Nut Cookies to make low carb ice cream sandwiches! If you miss what ice cream tastes like and don't want to pay $6 a pint you should make our low carb ice cream today! 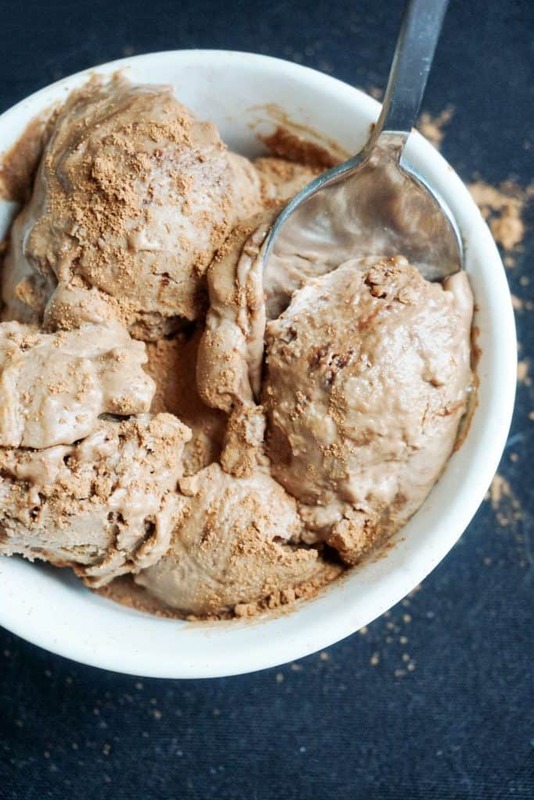 Recipe can be quickly added to MyFitnessPal - Search "KetoConnect - Low Carb Chocolate Ice Cream"
Combine the heavy whipping cream and swerve confectioner into a medium-high heat sauce pan. Bring to a boil and reduce to simmer. Once simmering add in the coco powder and combine well. Try to get a many chunks out as possible. In a separate bowl combine 2 egg yolks and vanilla extract. Set aside. Continue to stir as cream, sugar and coco powder mixture starts to thicken. Once thick (as shown in video) remove from heat. Allow to cool for 5 minutes. Once cooled slowly add the cream mixture to the yolks as you whisk with a fork or hand mixer. Once it is all throughly combined whisk until you get a slight froth at the top. Place into freezer for 4-6 hours, checking on it and stirring it every 1 hour. Ours was set and ready to eat at 4 hours. TIP: If you freeze it over night you will want to let it sit out for a bit for it to be scoop-able. Enjoy!